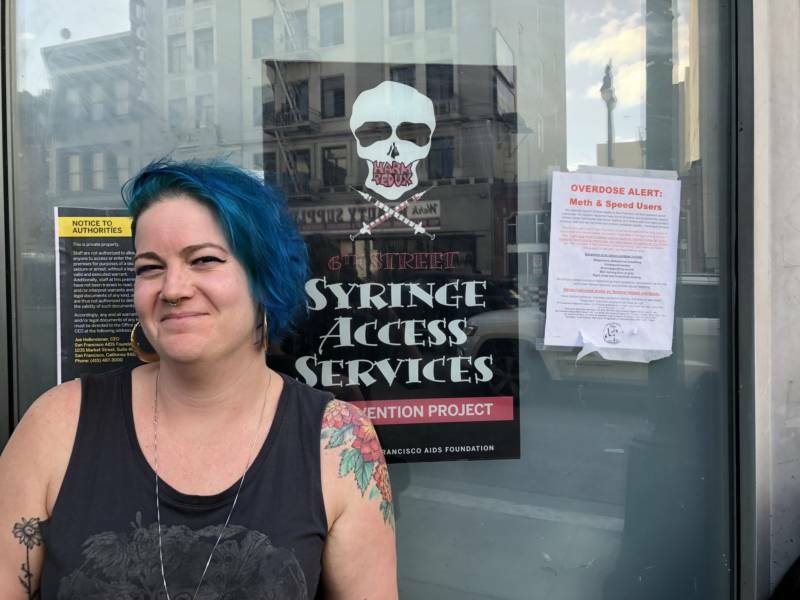 The only way you’d know you’re passing by a needle exchange at Sixth and Mission streets in San Francisco is a black poster with white lettering that reads, "Syringe Access Services." The words are topped with a rebellious-looking image of a skull with hypodermic needles as the crossbones. If you pause here, at the 6th Street Harm Reduction Center, and look closer, you may also see a smaller sign with red and black lettering. It warns people who use methamphetamine and speed that there may be something unexpected in their drugs: the opioid fentanyl. In February, three men were found dead outside a high school in San Francisco’s Haight-Ashbury neighborhood. They had been smoking meth, and city health officials believe the men did not know their drugs were laced with fentanyl. They died from opioid overdoses caused by the drug. While California has made some positive strides in the fight against opioids (the latest data show that prescriptions in the state are down), deaths from one particularly powerful opioid, fentanyl, are up. As this opioid increasingly shows up in street drugs, California is fighting back with a new tool: easy-to-use test strips that can detect the presence of fentanyl in other drugs or substances. 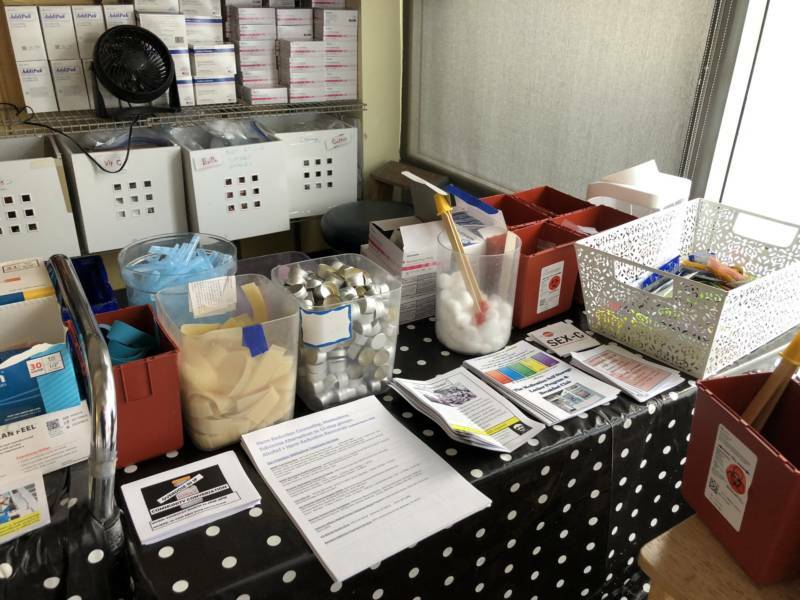 While the front room of the Harm Reduction Center in the South of Market looks like a standard needle exchange -- offering syringes, cotton balls and other accessories for injection drug use -- the rest of the center offers much more. Staffers give out Narcan (naloxone), a rescue drug that can reverse an opioid overdose and save a life. They also train clients how to properly use it. There are individual rooms for counseling and for medical care, and a larger lounge for group meetings or even movie nights. The center is a project of the San Francisco AIDS Foundation. I met a woman who goes by the name Jade, 31, in a back room at the center. She has light hair, and pink and green eyeshadow. Jade was there for the "Opiate User Lounge." Since Jade buys and uses illegal opioids, KQED is not identifying her legal name. The lounge is a welcoming, nonjudgmental place where people who use opioids can access medical and mental health care. Staff also teach clients about overdoses and other health conditions associated with drug use. The idea is that eventually the lounge becomes a stop on the pathway for people who want to reduce or cease their opioid use. For Jade, though, the lounge simply feels like a place where she can hang out, read and rest, without anybody trying to fix her. Jade was a teenager living with her family in Los Angeles when she was diagnosed with lupus, a disease in which the body’s immune system attacks its own organs and tissues. Lupus can cause intense joint pain. Shortly after her diagnosis, her pain got so bad that she landed in the emergency room. Her treatment there was the first time she felt significant relief. "They gave me some morphine," she said. "And I was like 'Wow, I don’t want to die anymore.' Because I couldn’t escape the pain." But Jade said it became hard to alleviate her pain through prescriptions, and by her late teens, she had turned to heroin. She also liked the euphoria. "You don’t feel pain at all, you really don’t," Jade said. "As long as you are in that space, everything is not just copacetic but beautiful." She first came to the 6th Street Harm Reduction Center seven years ago to get supplies from the needle exchange. Gradually, Jade became more involved with the center. She did a training on how to use naloxone, and now carries it regularly. Jade said she has used it to revive four people. These days, Jade keeps coming back to the center for the sense of community. After our interview, she helped pick up dirty needles on the streets outside, and then stayed afterward for pizza. Jade still struggles with pain, and has legal prescriptions for opioids like morphine and methadone. But she supplements them with street drugs like heroin and fentanyl. Fentanyl’s recent arrival in California is raising alarms across the state. Overdosing on any opioid is dangerous because the drug can slow or even stop a person's breathing. But Fentanyl is 30 to 50 times more powerful than heroin, making the overdose risk extremely high. Fentanyl was found in the bodies of both Prince and Tom Petty after they died. What makes fentanyl even more dangerous is that it is now being mixed into all kinds of drugs, often without the users' knowledge. It's been found in heroin, but also anti-anxiety medications like counterfeit Xanax, and illegal stimulants like cocaine and meth. "That’s when it becomes scary," said Kristen Marshall, who runs overdose prevention and naloxone distribution for the Harm Reduction Coalition. "People aren’t expecting an opioid overdose and may not know what they’re seeing," she said. This is especially true for people who use drugs that are not opioids, because they have less tolerance for opioids’ effect on the body, and can overdose on a smaller amount. "Those are people that are not prepared," Marshall said. Jade said she has seen the same thing happen with cocaine: "People have been dying or overdosing because they are expecting cocaine and it’s not just cocaine. And they don’t have any tolerance." So if fentanyl is often hidden in other drugs, how can you detect it? Terry Morris runs the Sixth Street center where Jade hangs out. 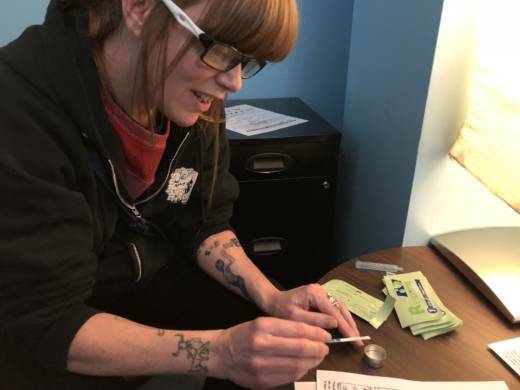 In a counseling room at the center, she demonstrated how to use a fentanyl test strip. "It's a really simple process, if anybody's ever used a home pregnancy test," Morris said, holding a slender 3-inch strip of paper. Morris added water to a small metal cap. If she were testing with actual drugs, and not just demonstrating, she would mix drug residue into the water. Then Morris submerged one end of the test strip for 15 seconds, removed it and waited another 15 seconds. "One line means fentanyl and two lines mean no fentanyl is present," she explained. Since this was just a demonstration, two lines appeared, meaning the water she practiced with was fentanyl-free. Each strip costs a dollar, but Morris gets them for free from the state. Last May, the California Department of Public Health began buying the strips and distributing them statewide to harm reduction centers like this one. It has spent $46,381 on the effort so far. In San Francisco, five sites have been trying out the test strips since August 2017. So what happens if the test shows the presence of fentanyl? The strips don’t tell a drug user how much fentanyl is there, just that it’s present. Some people will not use drugs laced with fentanyl, Terry Morris said. But others will go ahead and use the drugs, she said. They’ll be able to use them differently, though, taking steps to reduce the risks. "You can choose to use less of the drug," Morris said. "You can choose to use a tiny bit of the drug and see how it affects you. You can choose to stagger your use" -- meaning people in a group take turns and watch out for each other. Some people make sure that they have naloxone nearby, in case of an overdose. But the test strips offer more than a safety check, according to the staff members. The process requires users to simply pause: while waiting for results, they often sit down and end up talking with counselors. Morris says those conversations are a way to encourage clients to check out other resources here, and perhaps to eventually stop using.